“We find that 94% of net job growth in the past decade was in the alternative work category,” said Krueger. “And over 60% was due to the [the rise] of independent contractors, freelancers and contract company workers.” In other words, nearly all of the 10 million jobs created between 2005 and 2015 were not traditional nine-to-five employment. Has this analysis stood the test of time since then? (Barely registering as an answer.) The claim on US broader (given its time frame) and deeper (given the lower level of unemployment there), but I find it a bit more believable after I read in a 2017 FT article that Europe has seen a similar phenomenon since 2013. 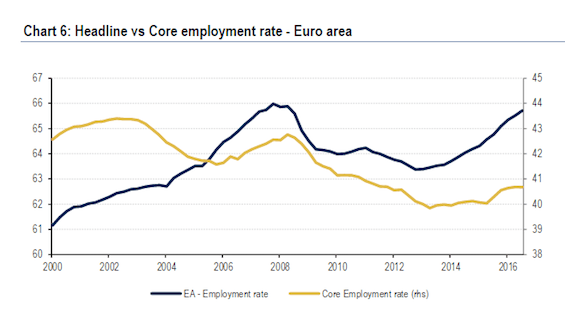 A new report from Bank of America Merrill Lynch titled “Job Quality and Escape Velocity” shows much of the impressive falls in eurozone unemployment over last three years has been underpinned by jobs of “deteriorating quality”. “The improvement in the quantity of jobs has been offset by a significant deterioration in their quality”, says Gilles Moec, European economist at BAML. “The near-entirety of the rebound in the headline employment rate since 2013 can be ascribed to ‘lower quality’ jobs”, adds Mr Moec. The actual report is doesn't seem to be online. Anyway, it looks like the head of the ECB is conceding this fact. Asked if Europe will fully recover from its recession, Mr Draghi said: “Europe has recovered from the recession. "Now it has been around four and a half years the economy has been expanding and employment is higher tan ever. A large amount of these jobs are either temporary or part time jobs. By far the highest proportion of part-time workers in 2016 was found in the Netherlands at 46.6 percent, followed by Austria, Germany, Belgium, the United Kingdom, Sweden, Denmark and Ireland, where part-time work accounted in each case for more than a fifth of those in employment. Part-time work has increased distinctly between 1993 and 2016 in Germany, Ireland, Italy and Austria In 2015 the amount of part-time workers were 19 percent in the EU area, it fell to 18.9 percent in 2016. However, it has now become a concern again. The quality of jobs in Canada has dipped to its lowest level in a quarter century, revealing a structural issue that could prove difficult to reverse, says a new study by CIBC. The big bank said Thursday its employment quality index, which slipped 1.8% last year, was down 15% since the early 1990s. The index examines the distribution of full- and part-time positions, the gap between self-employment and the higher-quality jobs for paid employees, and whether full-time jobs were created in low-, medium- or high-paying sectors. The study found that since the late 1980s the number of part-time positions climbed much faster compared with the higher-quality full-time gigs. On the bright side, it said the number of full-time jobs increased at twice the speed of part-time jobs over the past year. However, the damage to full-time work during each recession was largely permanent, the study added. Over roughly the same period, the number of self-employed jobs, generally considered lower quality because they usually pay less, also rose more quickly than salaried positions. For 2014, CIBC found the number of self-employed positions increased four times faster than paid employment. By sector, the bank said the number of low-paying positions had increased faster than higher-paid jobs since the early 1990s. Were more than a half of all Silicon Valley tech companies founded by immigrants between 1995 and 2005? Are there US military bases where only singles can work?